Step by step, the young French brand Reservoir manages to impose its singularity on the watchmaking landscape. Its visibility grows, its distribution network expands and above all, its collection becomes larger as evidenced by the presentation of the Longbridge collection during the last edition of Baselworld. Reservoir offers first and foremost a very simple and effective starting point: the coherence between the design and the time display. The latter, based on the principles of jumping hours and retrograde minutes, makes it possible to reproduce the aesthetics of a meter. 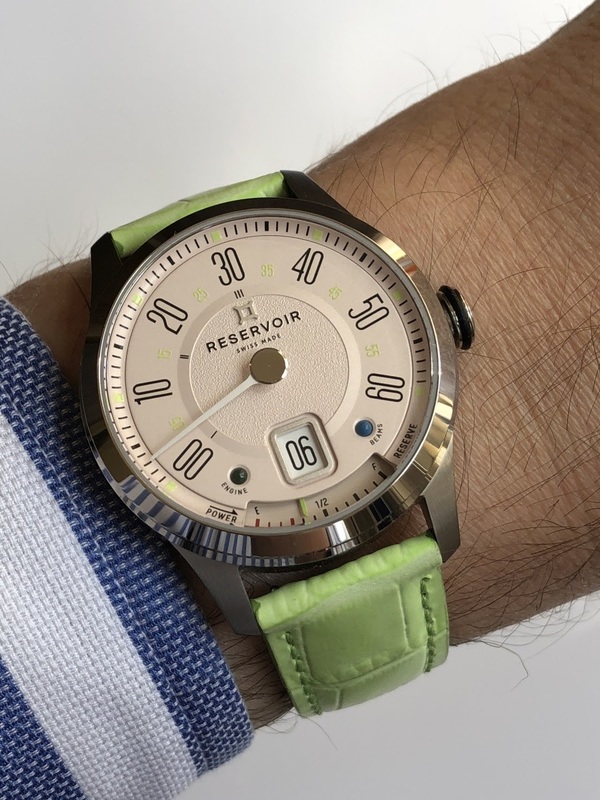 This is certainly not the first time that a watch has been inspired by a measuring instrument to draw its dials, but Reservoir's peculiarity is that it has been able to convincingly insert its concept in three different atmospheres (cars, aeronautics and marine), with very distinct personalities. The automotive world is currently the cornerstone of the brand. It is the one that offers the biggest inspiration and creative potential taking into account the numerous dashboards that have marked the automotive history. And unlike the aircrafts or submarines dashboards that ultimately only very few people can face, automotive meters and instruments are part of popular culture and bring us more easily some memories. 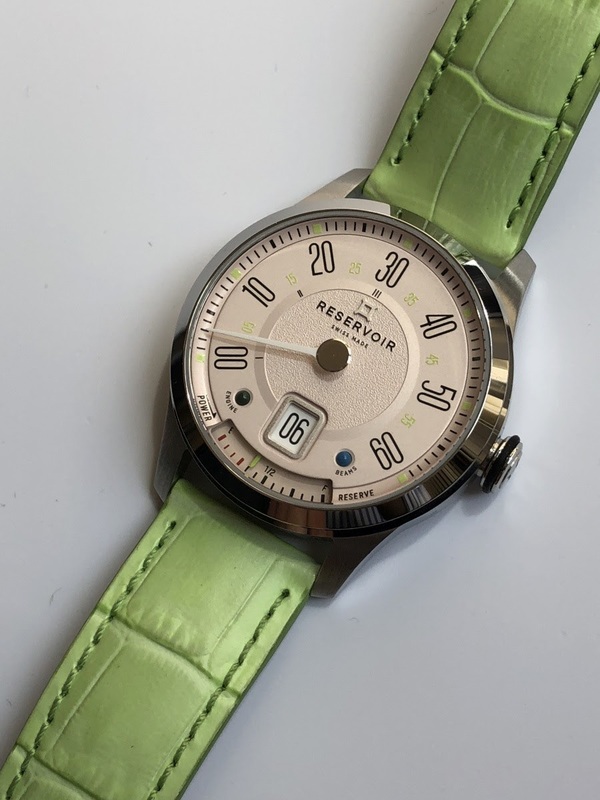 The inaugural collection of Reservoir, unveiled in 2017, consists of models using a 43mm case. This size may seem too imposing. However, it is adapted to the stylistic context of Reservoir and also makes it possible to make very legible the scale representing the minutes based on a peripheral arc of 240 degrees. Each watch of this first collection is organized according to the same principle: the minutes scale occupies mainly the upper zone of the dial while the lower zone is dedicated to the jumping hours window and the power reserve display. Effectively retranscribing the aesthetics of these old automotive, aircraft or submarine meters, the Reservoir watches presented in 2017 seduced me thanks to the special charm they exude while preserving the essential: the time legibility because it would have been a paradox that a watch, by definition a measuring instrument and, moreover, inspired by other measuring instruments, would have been unusable on a daily basis. The 2018 edition of Baselworld marks a decisive step for Reservoir: that of maturity and openness. 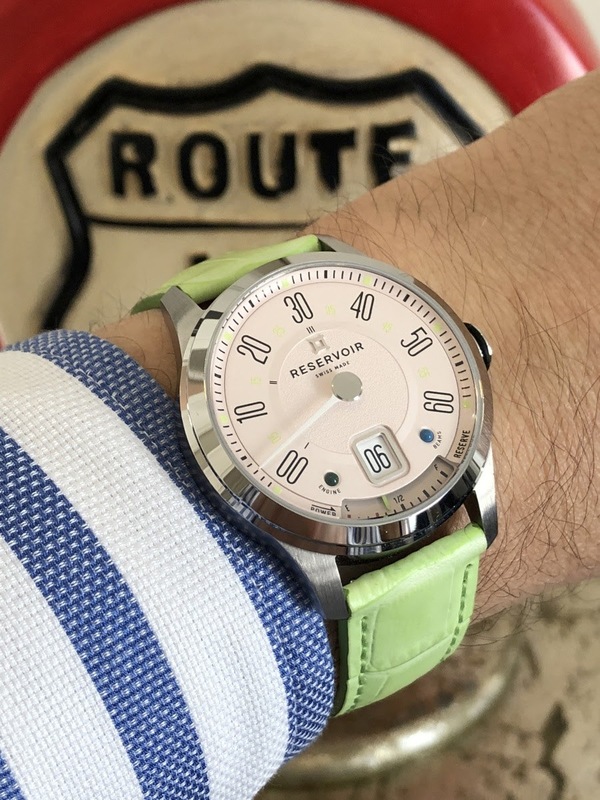 It is necessary to admit it, because of their size and their very rigorous and radical design, the watches of the first collection are dedicated above all for a clientele in search of a product at the same time sober and powerful. It was however important for Reservoir to be able to attract a wider clientele without denying the guiding ideas that led to the creation of the brand identity. It is the aim of the Longbridge collection. To tell the truth, everything changes and nothing changes with this collection. Nothing changes because I find the same dial lay-out that spreads the functions identically by positioning from top to bottom, the peripheral minutes, the hours window and the power reserve display. The beautifully retro atmosphere inspired by a vintage meter remains: this time, it is the dashboard of an Austin Mini that defines the different style effects and details. Finally, the movement remains the same. But everything changes because of a fundamental move: the diameter of the case decreases from 43 to 39mm. And such a size change leads to many impacts. The most complicated, in such a context, is to preserve the legibility of the watch. It explains why a special care was taken to design the dial and in particular the minute scale. By alternating the dimensions of the numerals and by positioning the scale on a more pronounced flange, Reservoir managed to maintain the presence of indexes every 5 minutes while maintaining an airy and pleasant rendering. So, at no time did I feel that the dial was more concentrated than with a 43mm watch. The Longbridge Reservoir is not only smaller, it is also more refined and more subtle. The Mini's meter gave Reservoir the opportunity to position two gemstone cabochons around the hours window to remind the original diodes. And it is by looking more closely at the dial that I realize the quality of work, the different textures and relief effects. The whole seems more elegant while maintaining the strength and visual impact of the usual time display of the brand. 3 dial colors are available. 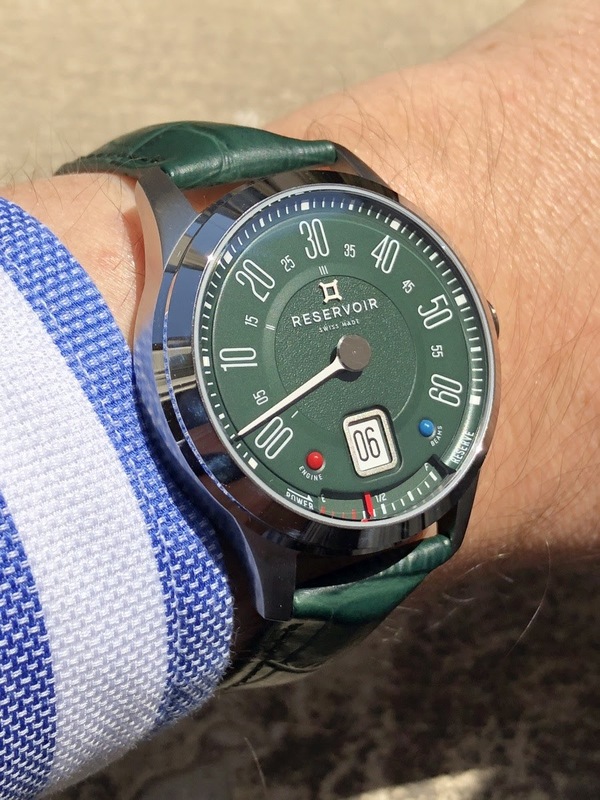 Given the origin of the meter that inspired the Longbridge, it is the green "British Racing" dial that I prefer. 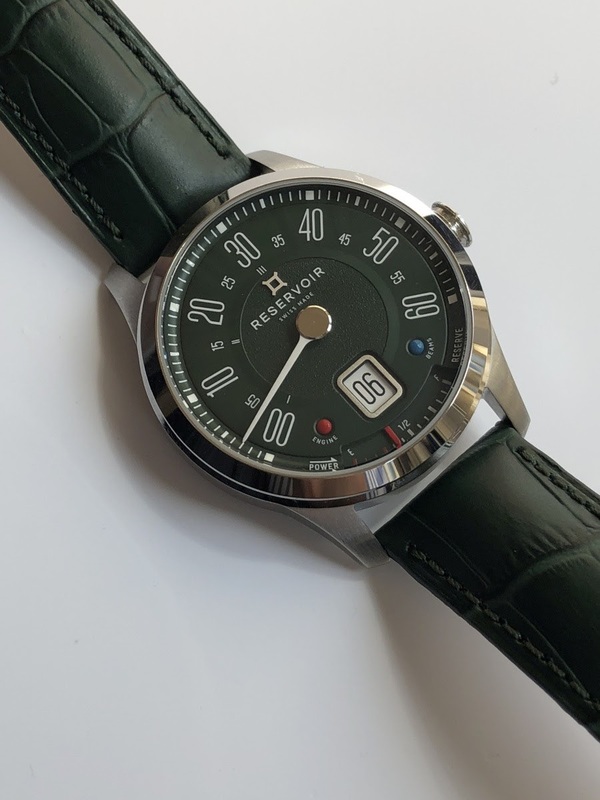 This version is also the most original and perhaps the most trendy: I ​​observed this year a rise in green dials offer within the different brands. 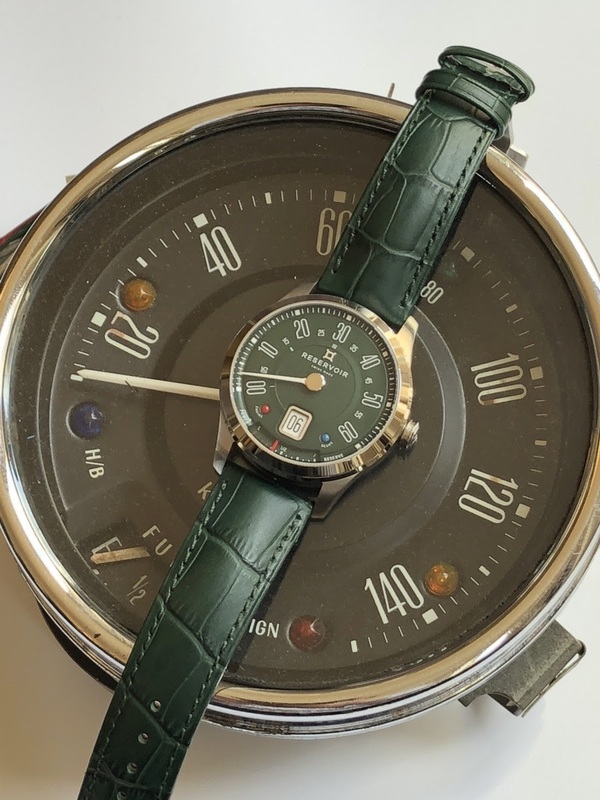 Anyway, when the green dial is combined with a green bracelet as it is the case on the pictures, the result is beautiful. The black dial of the "Club" version is the most classic and this more traditional side is reinforced by the brown bracelet. Finally, the beige dial of the "Lady Longbridge" is more feminine as the name of the version indicates it. With pastel colored bracelets, the watch becomes ideal for summer. But don't be wrong, whatever the version, the Longbridge is without any doubt an unisex watch. Its size is perfect for my taste. 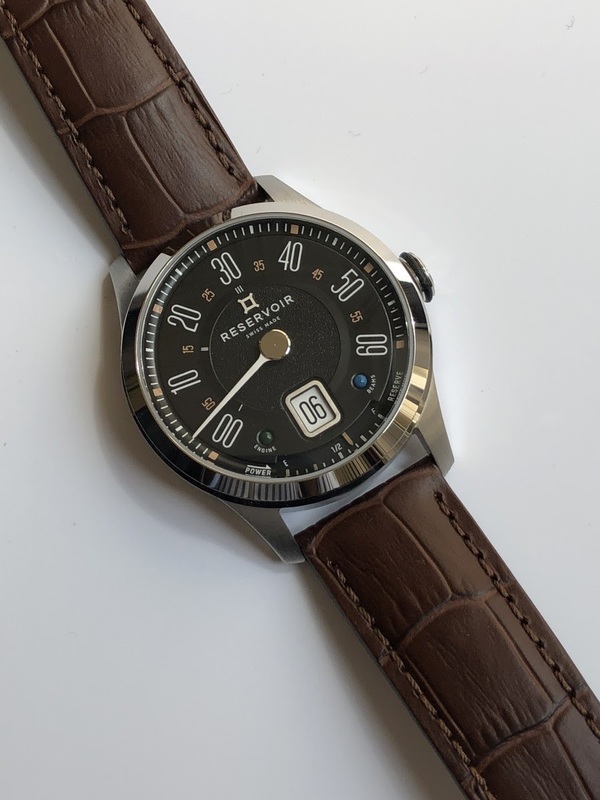 The diameter remains sufficiently contained to remain wearable in all circumstances and large enough to read the information on the dial without any issue. The steel case has a satin finish, well in the spirit of the dial. The crown is screwed down and the water resistance is 50 meters and each watch in the catalog offers the same performance. But unlike watches with a diameter of 43mm, the caseback of the Longbridge is solid. The reason is simple: this choice was made to reduce the thickness of the case and to maintain the similar proportions to those of other models. I think it's an excellent decision and in any case, the basic caliber is not spectacular. Note that each watch in the Longbridge collection comes with a steel butterfly folding clasp. 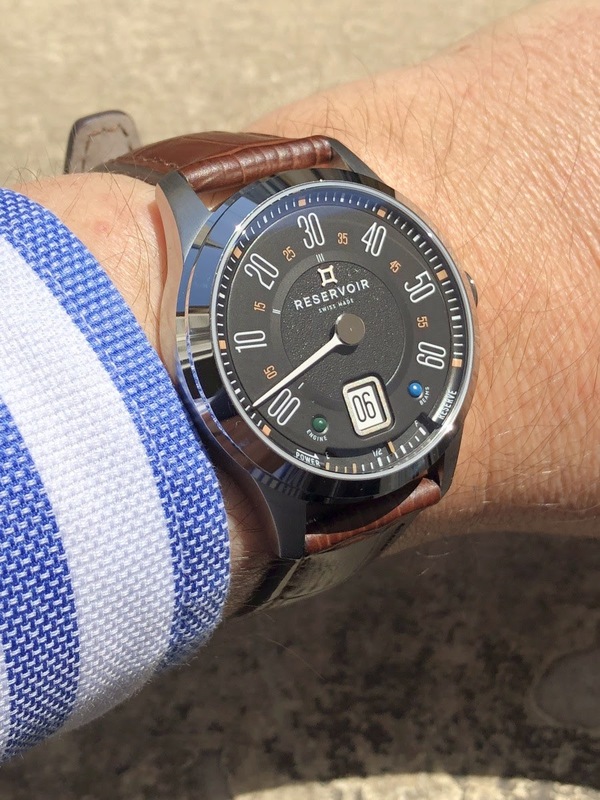 I would like to see this watch, more dressed and elegant, also available with a pin buckle. An original display is relevant if the mechanics are efficient and support it with reliability. A watch may be original, seductive and interesting, if the movement was capricious, it would appear as a vain exercise. A display that includes jumping hours and a retrograde hand is not trivial. Simply because the behaviors are not constant as with a classic watch. Once per hour, a double instantaneous and violent action intervenes with the jump of the disc of the hours and the back move of the hand. The movement of the Reservoir watches responds to this challenge. It is made of a basic caliber ETA 2824-2 and an exclusive module developed by Télôs, the company of Johnny Girardin and Franck Orny who worked on Harry Winston's Opus 14 or Montblanc's Metamorphosis. They are very impressive references of complicated watches. But what is required here is also demanding: the module must perfectly manage the displays of hours and minutes, with reliability and with the necessary security to prevent mishandling. I must admit that I was very convinced by the module, either when setting the time or when the watch simply runs. The jumps are precise, the hand is positioned correctly and the energy consumption is reasonable. Indeed, the power reserve is around 37 hours (fortunately the power reserve display is very useful!) so basically 5 hours less than for a caliber ETA 2824-2 without module. Anyway, I very much appreciate that this caliber was chosen rather than 2892. Personally, I find that the 2824 has a better winding efficiency. The 2892 is more prestigious, finer ... but I prefer the 2824! The Longbridge Reservoir is a collection that I really liked. First of all, because I like its coherent aesthetic that offers many attractive details. Then because the execution is qualitative: the movement is convincing, the finishes are flawless and the collection has no difficulty in transporting us in its so delicious "vintage car" atmosphere. It is the "British Racing" version which gets my preference because its color brings a touch of originality and additional refinement. For me, the Longbridge collection shows a progression from Reservoir and it is felt in the pleasure when on the wrist. I appreciated the overall balance, the more contained size and the more elegant side. It gathers all the ingredients to allow the brand to reach a wider customer base, looking for an original watch without being excessive. Thanks FX for sharing.. its interesting.. Thank you FX.. We should..
always help the young brand.. I love 'em, and I hope they come stateside. Thanks for sharing!